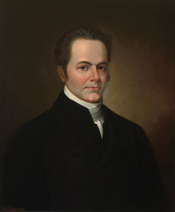 CHEVES, Langdon, a Representative from South Carolina; born September 17, 1776, in Bulltown Fort, near Rocky River, Ninety-sixth District (now Abbeville County), S.C., where the settlers had taken refuge from the onslaught of the Cherokee Indians; received his early education at his home and Andrew Weeds School near Abbeville, S.C.; joined his father in Charleston, S.C., in 1786 and continued his schooling in that city; studied law; was admitted to the bar October 14, 1797, and commenced practice in Charleston; city alderman in 1802; member of the State house of representatives 1802-1804 and 1806-1808; elected attorney general of the State in 1808; elected as a Republican to the Eleventh Congress to fill the vacancy caused by the resignation of Robert Marion, having previously been elected to the Twelfth Congress; reelected to the Thirteenth Congress, and served from December 31, 1810, to March 3, 1815; succeeded Henry Clay as Speaker of the House of Representatives during the second session of the Thirteenth Congress; chairman, Committee on Ways and Means (Twelfth Congress), Committee on the Naval Establishment (Twelfth Congress); declined to be a candidate for reelection in 1814 to the Fourteenth Congress and also the position of Secretary of the Treasury tendered by President Madison; resumed the practice of law; elected associate justice of law and appeal in December 1816; resigned in 1819; declined to accept an appointment as Associate Justice of the Supreme Court of the United States; elected president of the Bank of the United States March 6, 1819, and held this office until 1822, when he resigned; chief commissioner of claims under the treaty of Ghent; resided in Philadelphia and Washington 1819-1826 and in Lancaster, Pa., 1826-1829; returned to South Carolina in 1829; engaged extensively in the cultivation of rice in South Carolina and Georgia; tendered an appointment by the Governor of South Carolina to the United States Senate to fill the vacancy caused by the death of John C. Calhoun, but declined; delegate to the Southern convention at Nashville, Tenn., in 1850 and to the State convention at Columbia, S.C., in 1852; died in Columbia, S.C., June 26, 1857; interment in Magnolia Cemetery, Charleston, S.C.
Huff, Archie Vernon. Langdon Cheves of South Carolina. Tricentennial Studies, No. 11. Columbia: University of South Carolina Press, 1977.